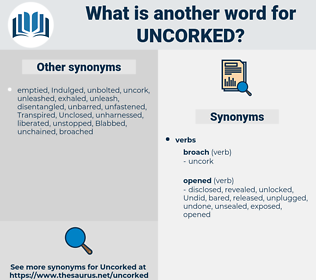 What is another word for uncorked? close up, not mention, end, die, finish, complete, close, conclude. 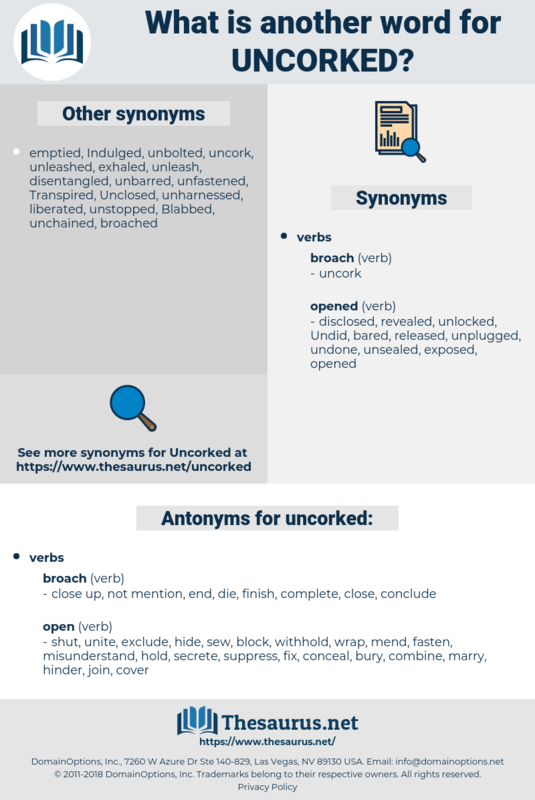 shut, unite, exclude, hide, sew, block, withhold, wrap, mend, fasten, misunderstand, hold, secrete, suppress, fix, conceal, bury, combine, marry, hinder, join, cover. He uncorked one of the bottles and half emptied it; then muttering a few words as to the strength and energy imparted by the liquor, he took the lamp, and fixing his eye on the bottle, said: It will take me only a few minutes to throw the body into the grave and fill it up; but the rest of the work will require more than an hour. He uncorked the bottle, and we tasted the stuff.